Currently on a U.S. tour for a month after having been in Europe since late June, the stop at NYC’s new (and great) Pier 17 at the South Street Seaport brings Sting home. (Listen to his song “Englishman in New York” for his thoughts on that.) With a stellar band consisting of longtime Sting guitarists Dominic Miller and Rufus Miller, and John Freese on drums, along with Shaggy’s keyboardist Kevon Webster and his excellent backup singers Melissa Musique and Gene Noble, with Sting holding down the bass and lead vocals along with Shaggy, they sounded fabulous. Combined with the open air of this outdoor, rooftop venue with the downtown NYC skyline below, it was a very memorable night. The songs of Sting, (looking much younger than his 66 years, and very fit), worked so well in their weaving with 49 year old Shaggy’s. Tunes such as Shaggy’s “Oh Carolina” blended with Sting’s “We’ll Be Together” very nicely, as did Sting’s “Dream of the Blue Turtles” with his own reggae infused “Love is the Seventh Wave,” whereby Shaggy could really step into and expand on it. Several Police songs were performed, such as gems “Message in a Bottle” and “Walking on the Moon,” with the latter coupled with Bob Marley’s “Get Up, Stand Up.” (Complete set list below). Sting and Shaggy (born Orville Burrell and renamed after the Scooby-Doo cartoon character) clearly were having a great time and enjoy each other’s company and output. 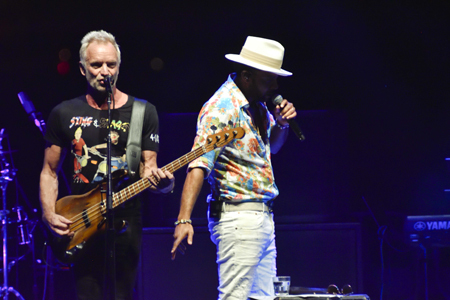 The infectious looseness and and playfulness of Shaggy seems to have rubbed off on Sting, which makes for fun times. After having tackled rock, new wave/punk, jazz and Broadway, this CD and tour with Shaggy bring Sting back to his roots that The Police incorporated into their very unique sound, that being Reggae. And as the enthusiastic audience of approximately 3,400 basked in the outdoors of a just turned Autumn, this musical pairing is a breath of fresh air. Catch them live and get their CD, as this is hot stuff.